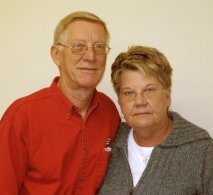 Larry and Judy Kramer opened the first Kramer Hardware in 1989 in Clear Lake Iowa. The original location was in what is now the Village General Store. The store is now located at 580 Highway 18 E. It was managed for many years by Larry and Judy’s daughter Kim. In 1991 the Kramers bought a store in Mason City Iowa on South Illinois avenue. The building once housed a roller skating rink in the 1970’s. The Kramer's son Randy managed that store from 1991-2000 and their daughter Kris managed the store from 2000 until she moved to the Kramer Hardware Corporate office in 2010. In 1993 Larry and Judy opened a second hardware store in Mason City Iowa in the Willowbrook Mall. That store was relocated to Garner Iowa in 1995. The store moved to a new building in 2011 in Garner where it is flourishing. It is managed by the Kramer's son Mike. All the Kramers have extensive backgrounds in retail. Larry worked in management for Osco Drug and as a district manager for Peoples Drug before starting Kramer Hardware. Judy has a background in advertising and accounting. Mike was a merchandising manager for Reliable Drug. Kris and Kim worked for Walgreens in management. Kramer hardware currently has stores in Clear Lake, Mason City and Garner. Kramer Hardware’s excellent associates have helped them to continue to operate stores in Northern Iowa. 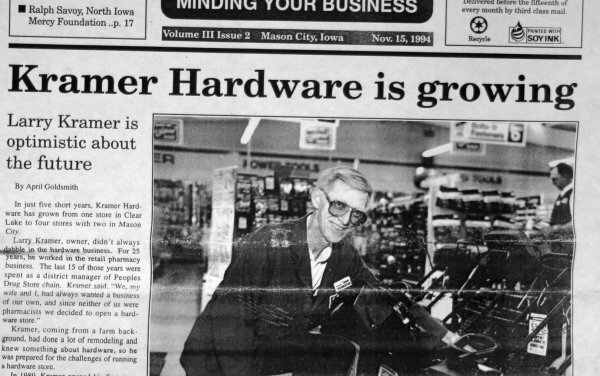 In 1994 Larry Kramer was featured in this article and stated, "Service is the big difference and we provide that with product knowledge and helpful sales associates add value for our customers and that is the big key to the success of our business."